Hello! My name is Dr. James G. Salmons. Success With Money , as presented in the website and the blog, is a project I started to share information designed to help as many people as possible become as successful as possible with their money. I have many years of experience teaching others success and personal development principles, more recently focusing attention on achieving financial success. Over the years I worked directly with businesses, churches, and organizations such as the Jaycees. In light of the economic stresses created by our economic climate in America and around the globe, early 2008 I launched the Success With Money website in order to reach out to the larger audience available through the internet with the help people need to deal effectively with financial matters in our ever changing and challenging world. The basic site offers at no charge all the information people need to get in control of their money, get out of debt, increase income and provide for their financial future. It is not intended to tell people what to do with their money but to teach people how to make the kind of financial decisions they need to make for themselves to become successful with money. 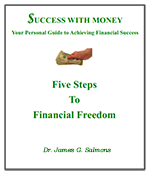 The Success With Money Blog was added to the website in January 2011. It seeks to add two specific factors to the project. One is to help apply financial success principles to current events and life situations. The other is to enable readers an opportunity to interact with the site’s information on a personal level, providing feedback which can helpfully guide future content. Here’s wishing you good success with your money and with your life.